Training others to teach children is a vital part of our ministry. We offer several options for training. The Teacher Training Class is designed to help the Good News Club teachers and other volunteers to be prepared to teach their clubs each week. However, the free classes are open to any children’s workers who would like ideas to implement in their church ministries. You may contact Anna in advance if you would like to know the special training subject scheduled for an upcoming class. Teacher Training Classes are typically held twice a month October-March, with the exception of December. See our Events page for the schedule. We have one day of Camp Staff Orientation every June. 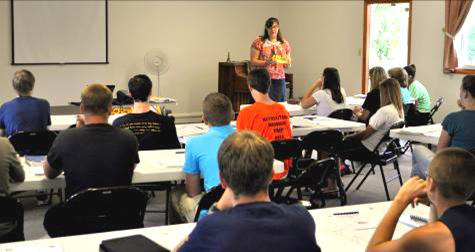 We are the host county for the two-week Summer Missionary Training School of Child Evangelism Fellowship of Eastern PA, Inc. This is held at Mountain View Bible Camp. 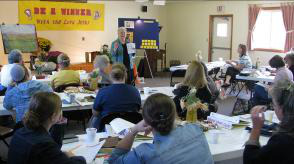 We offer seminars and workshops for local churches on such topics as Leading a Child to Christ, How to Share the Wordless Book, How to Weave the Gospel into a Bible Lesson, and Teaching Missions to Children. Many more subjects are available to be taught by either county staff or state headquarters staff.